Visit France in January and you’ll find half the country celebrating the ski season in the glorious, snow-covered mountainous Alps, and the other half, it might seem, enjoying the semi-annual sales. Jack Frost might be nipping at your fingers, but it’s a good time for bargains—on airfares, hotels, and package deals. So, yes, while it can be cold—especially in the country's northern reaches—January is a great time to spend time indoors shopping, outdoors skiing, or cozying up in a café with a mug of chocolate chaud and a croissant. The weather is variable in January. Some days will be cold but beautifully clear and crisp, but on other days it might be snowing or raining. The south of France can get cold, and it can rain, but it is extremely unlikely to snow. The Riviera along the Côte d'Azur, after all, is where the rich have traditionally gone to escape winter, and Nice almost never gets a snow day. No matter where you go in France, though, expect the full range of weather (and it can get very cold at night) and you won’t be caught by surprise. The climate varies hugely depending on where you are in this large country, but on average you can expect 18 days of rain in Paris, 15 in Bordeaux, 15 in Strasbourg, 14 in Lyon, and nine in Nice. When it comes to Snow, Strousbourg sees on average seven days of snow, while Paris has four, Lyone two, and Bordeaux just one day of snow in January. If you are traveling around France you may need to pack different types of clothes for different cities. But remember that no matter where you go, January can be very cold, so even in the south of France, you will need a good jacket and coat for going out at night. January in France brings a range of events and activities, ranging from the government-sponsored winter sales to great skiing. The winter sales (les soldes d'hiver) offer wonderful bargains, with savings of up to 70 percent. They are tightly controlled by the government, so they are genuine sales of the previous season's stock. They typically run from mid-January through mid-February. Paris Fashion Week (held mid-January) caps off the international season after shows in New York, London, and Milan. The first week of the two-week affair is dedicated to men's fashion. New Year's Day is January 1. Many shops, cafés, and other attractions will be closed for the holiday. France has some spectacular skiing areas and some of the best slopes in the world. Many are in the Alps, but the other main mountain ranges also offer good skiing, both overland cross-country, and downhill. January is a nice time to visit France, as there are few crowds and no long waits for tourist attractions. Additionally, prices are lower for both travel (airfares) and for hotels and you can get a good deal on flights. When visiting in January, beware that some hotels, particularly in the south of France, will be on their annual leave. Unpredictable weather can cause travel delays by air, rail or car. Be prepared and give yourself extra time if you'll be driving yourself within the country. 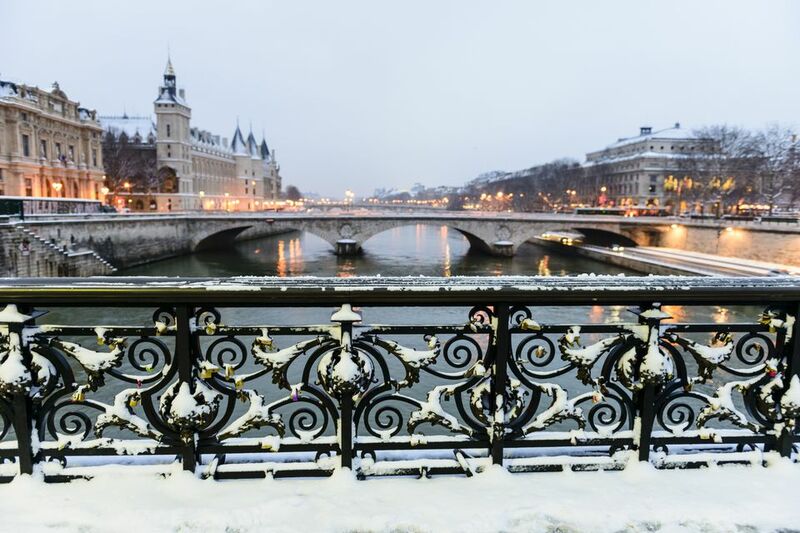 To learn more about the best time to visit France, and whether a winter vacation there is right for you, check out our guide to the country's weather each month.